The wall and the mat. Two very different challenges, two very different activities…. Or are they? Many pin adrenaline junkies to climbing and assign zen, meditative states to the art of yoga, making them seem as far apart as possible. But now is the time to shake off those misconceptions and find out why they actually make the perfect match! 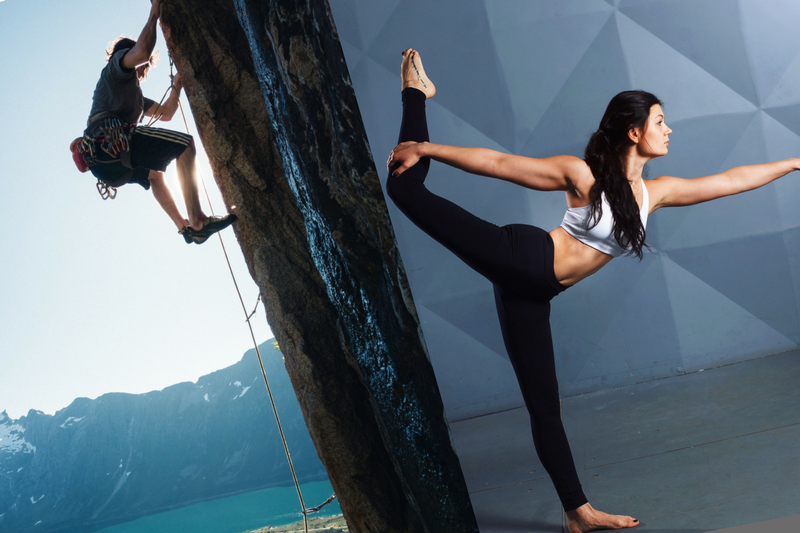 Yoga and climbing are two workouts that compliment each other incredibly. Not only do they bring about physical benefits that can aid the other, but combining them can also help you mentally during your sessions on the wall or on the mat. From stretching key muscles to honing your focus, find out exactly how yoga and climbing go hand-in-hand and why you should be incorporating them both into your workout routines. Let’s first look at what they both have in common. Yoga and rock climbing both involve mind and body working in unison. They both require mental focus and physical control, and getting to grips with your strengths and body movements. Both climbing and yoga involve challenging positions (some say climbing is like performing vertical yoga poses!) and focusing the mind - it’s key that you connect with the moment in order to maintain that difficult yoga position, or focus on your strategy to make it to the top of the wall. Whilst both these activities have movements which compliment each other, they also provide things which the other lack making sure your body gets a well-rounded workout. How will yoga help your climbing? Yoga can provide a myriad of poses that can help build your body strength and undo tight joints. From chest and hip openers to muscle bearing poses that involve holding your body weight for periods of time, it can condition your body to be supple and strong with lean muscle. It may take a while for a climber to adjust to the slow-paced flows of yoga after experiencing adrenaline-pumped climbing action, but be persistent in the stillness and holding these unfamiliar poses to see improvements on the wall. You may think that you don’t have to be flexible to haul yourself up a wall, but increased flexibility will not only allow you to bend into awkward poses on the boulders, but will protect you from injury. Flexible limbs can help keep your movements fluid, improve your range of motion and let you climb harder. But flexibility doesn’t appear overnight - you must be diligent over a long period of time to reap the benefits. Time for you weekly yoga class? From downward dogs to planks, yoga can give you strong core, supple hips and balanced shoulder muscles. Your upper body strength will benefit, especially those important lats for pulling actions. Be sure to incorporate yoga sessions throughout your week, or use a yoga class as a warm-up/stretching session before your climb. Scroll down to see great yoga poses for climbers which involve relieving aching feet, stretching achilles tendons, and stretching out tight hamstrings. Many climbers forget the importance of the breath when climbing the wall. Breathing techniques taught in yoga can help you keep balanced breath and avoid holding air in when under intense concentration or physical exertion. Yogic breathing involves deep mindful breathing that increases energy, releases stress and improves our mental and physical clarity. Develop an awareness of the body, feel strong and stable up the wall, amd feel connected to your movements. Incorporate yogic breathing into climbing movements like the professional climbers and find your focus in the regulation . Find out how to perform yogic breathing! How will rock climbing help your yoga practise? You’ll experience huge improvements in your lats. It’ll provide an intense workout for the arms through all the pull motions. Your hands and wrists will be strengthened. Climbing improves back strength that will bring stronger yoga poses. It can also improve your flexibility as you’ll move into positions that may not correlate with any of your usual yoga sequences. The art of focus really brings these two activities together. Yoga flows are timed with breath and should be replicated in climbs - however this will be a new challenge to yogi’s as the breath needs to be timed with both thought-out movements to aid the ascent, and concentration. Climbing can help hone a focused mind - if you get distracted in a flow, you can still go through the motions. If you get distracted on the wall, you fall. It’s no wonder that John Gill, father of American bouldering, calls climbing “moving meditation” - it makes for a fantastic workout that promotes the awareness of the body. "Aside from the physical benefits of moving and being generally active, yoga and climbing are so grea for the mind-body conection. They are both an interchange and balance (and constant rebalance!) both mentally and physically of challenge, fear, exhilaration, overcoming barriers and finding your calm throughout!" - Charlene, founder of Trika Yoga, Bristol. Yoga poses that will improve your climbing! Whether you’re a passionate yogi or a climbing fanatic, try these yoga poses to prep yourself for the wall. Each pose will help strengthen and improve your flexibility - use them regularly or incorporate them in your warm-up before getting your harness on! Do side stretches before climbing; any type of stretch that brings length to the whole side of the body feels great for our side muscles, back and spine. In between climbs, wrist stretches in particular in all directions relieve finger, wrist and forearm tension before you get onto the next climb! Any forward fold, standing or seated is also great to stretch out the whole backline of the body. And chest openers at the end of your climb are great to re-expand the front body after your climb, which tends to round in the shoulders and chest over time! Downward Dog: This will open up your hamstrings, calf muscles and hips. Be sure to rotate and wrap your shoulder blades towards your armpits so they wrap around your back, and keep your hips high. Don’t worry about getting your heels touching the floor - keep your back lengthened and as flat as possible. Turbo Dog: Fire up your upper arms! Begin with a Downward Dog, then bend your elbows 3 inches from the floor, moving them towards each other. It will ignite the arm and back muscles. Plank Pose: Strengthen your core. Assume the position of a traditional push up with arms straight, and be sure to have a neutral pelvis. Tuck the tailbone in to avoid tilts in the hips and maintain a long line through your ankle bones to the centre of your skull. Lengthen the spine and pull in the belly. Side Plank: Tone your arms and shoulders! From a Plank Pose, place one hand in the centre and rotate your body to its side - keep the height in the body and lift the hips. You can either stack the feet ontop of eachother or have them one in front of the other. Tree Pose: Stand on one leg and place your raised foot on the inside of the leg, either above or below the knee. Wherever you can reach comfortably. 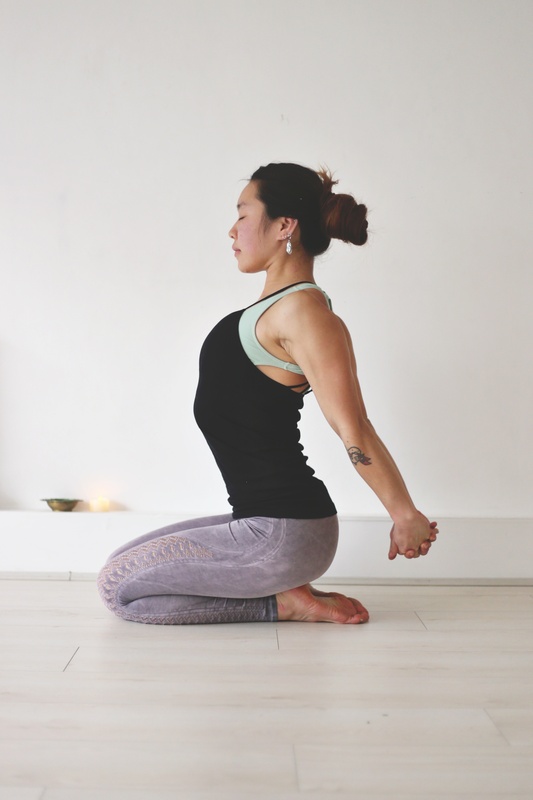 Tuck in the tailbone and either hold your hands in prayer position or above your head - this will help you find your centre and improve your balance. More and more climbing and yoga lovers are becoming aware of the benefits of practising both, which is why MoveGB sees these as two of our most popular activities. With one monthly membership, you can get access to multiple yoga studios and climbing centres across the nation, making it easier for you to keep your fitness and your practise at it's peak without having multiple memberships. Check-out which venues are available on MoveGB now and begin planning your new workout week! Many thanks to our brilliant Move partners in Bristol - be sure to follow them on their social channels!